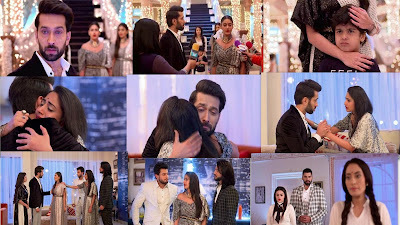 Home ishqbaaaz ishqbaaz-latest-news-updates Ishqbaaaz 21st March 2018 Written Update Written Episode "Shivaay's Big Decision Anika Supports Him"
Ishqbaaaz 21st March 2018 Written Update Written Episode "Shivaay's Big Decision Anika Supports Him"
Episode Starts with Reporters claim that Aryan is Rudra's Illegitimate Son and pressurize him to accept Aryan as his son, Shivaay gets worried about Rudra, He Sees him broken in front of All the People. Shivaay then Looks at Soumya and Veer smiling and realizes that Aryan is Veer and Soumya's pawn. Shivaay decides to take Step and He talks Himself while Looking at ANika that This Step will Break your heart But he has to take the extreme step and hopes that Anika would understand him. As Soumya makes the drama of crying, and About to Say Something to Reporters Shivaay stops the reporters and says that Shivaay has answers for them. Shivaay declares that Aryan is his son, Anika and all get shocked including Roop, Veer and Soumya. Reporters question Anika about her reaction and the truth, Anika supports Shivaay and calls Aryan as her son too. Reporters ask if Anika will accept Shivaay's illegitimate son, Anika reprimands reporters for calling Aryan illegitimate. Anika accepts Aryan as her son. Veer, Roop and Soumya remain shocked. Anika shares a look with Shivaay and walks away. Shivaay goes to Anika in the room and apologizes to her. Both get emotional , Shivaay says Anika saved their relationship and he had no other option. Anika consoles Shivaay and says she fell in love with him much later but she always loved Shivaay's dedication for his family. Anika tells Shivaay that he did nothing wrong, both hug each other. Roop scolds Veer for failure of their plan. Soumya wonders if the Anika is real and if not why did she support Shivaay. Soumya gets angry. Veer assures her that she will marry Rudra and decides to find Rosie Rani's truth. Anika worries about Aryan, Shviaay assures to find his real parents. Shivaay worries that Veer must have noticed real Anika's behavior in front of the media, Anika says she will take care of it. Rudra and Omkara come to Shivika's room, Rudra gets emotional and touches Anika's feet. Rudra thinks of Anika as his mother. Rudra feels lucky to have Anika as his Bhabhi, all get emotional.Omkara reminds Anika that they are more of her brothers as they did her Kanyadan. Gauri and Bhavya say they are in Shivaay's team. Shivaay and Anika console Bhavya over the situation. Shivaay says Veer will surely return with a big plan and before that Shivika, Rikara and Ruvya must be prepared with the plan. Shivaay declares that Ruvya wedding will take place next day. Precap : Veer tells Rosie Rani that because of her Plan got Failed But She Shows Script and Veer tells her that means Shivaay Knows about their Plan..Anika Turns and walks But Seeing her Ponytail Veer Calls Anika and She Stops and Veer Says Are You Anika ?